The Godfather Part II is a 1974 American crime film produced and directed by Francis Ford Coppola from a screenplay co-written with Mario Puzo, starring Al Pacino and Robert De Niro. Partially based on Puzo's 1969 novel The Godfather , the film is both sequel and prequel to The Godfather , presenting parallel dramas: one picks up the 1958 story of Michael Corleone (Pacino), the new Don of the Corleone crime family, protecting the family business in the aftermath of an attempt on his life; the prequel covers the journey of his father, Vito Corleone played by De Niro, from his Sicilian childhood to the founding of his family enterprise in New York City. 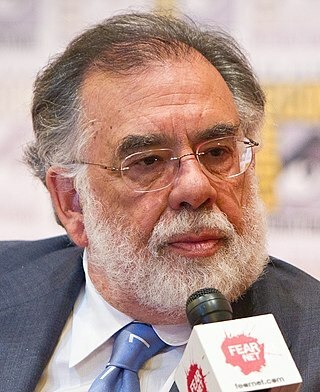 Francis Ford Coppola is an American film director, producer, screenwriter and film composer. He was a central figure in the New Hollywood filmmaking movement of the 1960s and 1970s. Mario Gianluigi Puzo was an American author, screenwriter and journalist. He is known for his crime novels about the Italian-American mafia, most notably The Godfather (1969), which he later co-adapted into a three-part film saga directed by Francis Ford Coppola. He received the Academy Award for Best Adapted Screenplay for the first film in 1972 and Part II in 1974. Puzo also wrote the original screenplay for the 1978 Superman film. His novel The Family was released posthumously in 2001. The Godfather Part II opened to divided reviews from critics. Its reputation, however, improved rapidly and it soon became the subject of critical reevaluation. It was nominated for eleven Academy Awards, and became the first sequel to win for Best Picture. Its six Oscar wins included Best Director for Coppola, Best Supporting Actor for De Niro and Best Adapted Screenplay for Coppola and Puzo. Pacino won the BAFTA Award for Best Actor and was nominated for the Academy Award for Best Actor. The Academy Award for Best Picture is one of the Academy Awards (Oscars) presented annually by the Academy of Motion Picture Arts and Sciences (AMPAS) since the awards debuted in 1929. This award goes to the producers of the film and is the only category in which every member of the Academy is eligible to submit a nomination and vote on the final ballot. Best Picture is the final award of the night and is considered the most prestigious honor of the ceremony. The Godfather Part III , a further sequel, was released in 1990. In 1901, the family of nine-year-old Vito Andolini is killed in Corleone, Sicily, after his father insults local Mafia chieftain Don Ciccio. Vito escapes to New York City and is registered as "Vito Corleone" on Ellis Island. In 1958, during his son's First Communion party at Lake Tahoe, Michael Corleone has a series of meetings in his role as the Don of his crime family. Corleone caporegime Frank Pentangeli is dismayed that Michael refuses to help defend his Brooklyn territory against the Rosato brothers, who work for Michael's business partner Hyman Roth. That night, Michael leaves Nevada after surviving an assassination attempt at his home. 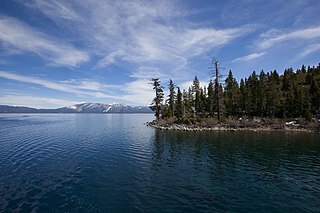 Lake Tahoe is a large freshwater lake in the Sierra Nevada of the United States. Lying at 6,225 ft (1,897 m), it straddles the state line between California and Nevada, west of Carson City. Lake Tahoe is the largest alpine lake in North America, and at 122,160,280 acre⋅ft (150.7 km3) trails only the five Great Lakes as the largest by volume in the United States. Its depth is 1,645 ft (501 m), making it the second deepest in the United States after Crater Lake in Oregon. Michael Corleone is the main protagonist of Mario Puzo's novel, The Godfather. 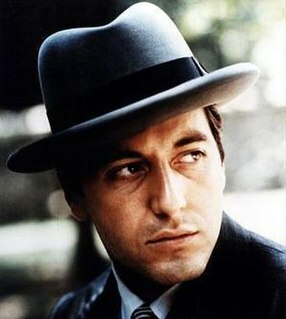 In the three Godfather films, directed by Francis Ford Coppola, Michael was portrayed by Al Pacino, for which he was twice-nominated for Academy Awards. In 1917, Vito Corleone lives in New York with his wife Carmela and son Sonny. He loses his job due to Don Fanucci insisting that his nephew work there; Peter Clemenza invites Vito to unwittingly take part in a burglary. Michael suspects Roth planned the assassination, but meets him in Miami and feigns ignorance. In New York, Pentangeli attempts to maintain Michael's façade by making peace with the Rosato family but they attempt to kill him. Roth, Michael, and several of their partners travel to Havana to discuss their future Cuban business prospects under the cooperative government of Fulgencio Batista; Michael becomes reluctant after reconsidering the viability of the ongoing Cuban Revolution. On New Year's Eve, he attempts to have Roth and Roth's right-hand man, Johnny Ola, killed, but Roth survives when Michael's bodyguard is discovered and shot by police. Michael discovers that his brother, Fredo, betrayed him after Fredo inadvertently reveals that he knows Ola after claiming they had never met. Batista abruptly abdicates due to rebel advances; during the ensuing chaos, Michael, Fredo, and Roth separately escape to the United States. Back home, Michael learns that his wife Kay has miscarried. By 1920, Vito and Carmela have had two more sons, Fredo and Michael. Vito's criminal conduct attracts the attention of Fanucci, who extorts him. His partners, Clemenza and Salvatore Tessio, wish to avoid trouble by paying in full, but Vito insists that he can convince Fanucci to accept a smaller payment by making him "an offer he won't refuse". During a neighborhood festa, he stalks Fanucci to his apartment and shoots him dead. In Washington, D.C., a Senate committee on organized crime is investigating the Corleone family. Having survived the earlier attempt on his life, Pentangeli agrees to testify against Michael, who he believes had double-crossed him, and is placed under witness protection. Now a respected figure in his community, Vito is approached for help by a widow who is being evicted. After an unsuccessful negotiation with Vito, the widow's landlord asks around, learns of Vito's reputation, and hastily agrees to let the widow stay on terms very favorable to her. In the meantime, Vito and his partners are becoming more and more successful, with the establishment of their business, "Genco Pura Olive Oil". On returning to Nevada, Fredo privately explains himself to Michael; feeling resentful at being disregarded, he had helped Roth in expectation of something in return—unaware, he claims, of the plot on Michael's life. He also informs Michael that the Senate lawyer, Questadt, is working under Roth's payroll. Michael responds by disowning Fredo, and tells his capo that nothing is to happen to Fredo while their mother is alive. Michael is unable to reach the heavily-guarded Pentangeli, so sends for Pentangeli's brother from Sicily, resulting in Pentangeli renouncing his previous statement; the hearing dissolves in uproar. Afterwards, Kay reveals to Michael that her miscarriage was actually an abortion, and that she intends to remove their children from Michael's criminal life. Outraged, Michael takes custody of the children and banishes Kay from the family. In 1923, Vito, along with his family, visits Sicily for the first time since emigrating. He and business partner Tommasino are admitted to Don Ciccio's compound, ostensibly to ask for Ciccio's blessing on their olive oil business. Vito exacts his childhood vengeance by killing Ciccio after revealing his former identity, but as they escape, Tommasino is shot in the leg and suffers a permanent disability. Carmela Corleone dies. At the funeral, Michael appears to forgive Fredo. Roth is refused asylum and denied entry to Israel. He is forced to return to the United States. Over the dissent of consigliere Tom Hagen, Michael sends caporegime Rocco Lampone to intercept and shoot Roth on arrival. Rocco is shot dead by federal agents after completing his mission. At the witness protection compound, Hagen reminds Pentangeli that failed plotters against the Roman Emperor often committed suicide and assures him that his family will be cared for. Pentangeli later slits his wrists in his bathtub. Al Neri, acting on Michael's orders, assassinates Fredo out on the lake. On December 7, 1941, the Corleone family gathers in their dining room to surprise Vito for his birthday. Michael announces that, in response to the attack on Pearl Harbor, he has left college and enlisted in the United States Marine Corps, leaving Sonny furious, Tom incredulous, and Fredo the only brother supportive. Vito is heard at the door and all but Michael leave the room to greet him. Michael sits alone by the lake at the family compound. The Godfather Part II was shot between October 1, 1973 and June 19, 1974, and was the last major American motion picture to have release prints made with Technicolor's dye imbibition process until the late 1990s. The scenes that took place in Cuba were shot in Santo Domingo, Dominican Republic. Charles Bluhdorn, whose Gulf+Western conglomerate owned Paramount, felt strongly about developing the Dominican Republic as a movie-making site. Coppola discusses his decision to make this the first major motion picture to use "Part II" in its title in the director's commentary on the DVD edition of the film released in 2002. Paramount was initially opposed because they believed the audience would not be interested in an addition to a story they had already seen. But the director prevailed, and the film's success began the common practice of numbered sequels. Was featured on Sight & Sound 's Director's list of the ten greatest films of all time in 1992 and 2002. Is ranked #7 on Entertainment Weekly 's list of the "100 Greatest Movies of All Time". The Godfather Part II did not surpass the original film commercially, but in North America it grossed $47.5 million on a $13 million budget. It was Paramount Pictures' highest-grossing film of 1974 and was the seventh-highest-grossing picture in North America that year. Coppola created The Godfather Saga expressly for American television in a 1975 release that combined The Godfather and The Godfather Part II with unused footage from those two films in a chronological telling that toned down the violent, sexual, and profane material for its NBC debut on November 18, 1977. In 1981, Paramount released the Godfather Epic boxed set, which also told the story of the first two films in chronological order, again with additional scenes, but not redacted for broadcast sensibilities. Coppola returned to the film again in 1992 when he updated that release with footage from The Godfather Part III and more unreleased material. This home viewing release, under the title The Godfather Trilogy 1901–1980, had a total run time of 583 minutes (9 hours, 43 minutes), not including the set's bonus documentary by Jeff Werner on the making of the films, "The Godfather Family: A Look Inside". The restoration was confirmed by Francis Ford Coppola during a question-and-answer session for The Godfather Part III , when he said that he had just seen the new transfer and it was "terrific". After a careful restoration of the first two movies, The Godfather movies were released on DVD and Blu-ray Disc on September 23, 2008, under the title The Godfather: The Coppola Restoration. The work was done by Robert A. Harris of Film Preserve. The Blu-ray Disc box set (four discs) includes high-definition extra features on the restoration and film. They are included on Disc 5 of the DVD box set (five discs). This film was the first sequel to have won the Academy Award for Best Picture. The Godfather and The Godfather Part II remain the only original/sequel combination both to win Best Picture. Along with The Lord of the Rings , The Godfather Trilogy shares the distinction that all of its installments were nominated for Best Picture. The Godfather is a crime novel written by American author Mario Puzo. Originally published in 1969 by G. P. Putnam's Sons, the novel details the story of a fictional Mafia family based in New York City, headed by Vito Corleone. Puzo's dedication for The Godfather is "For Anthony Cleri". The epigraph for The Godfather is "Behind every great fortune there is a crime. -Balzac." The novel covers the years 1945 to 1955, and also provides the back story of Vito Corleone from early childhood to adulthood. Frederico "Fredo" Corleone is a fictional character in Mario Puzo's novel The Godfather. 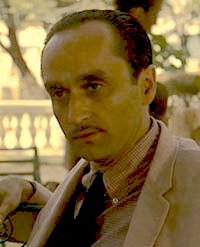 Fredo is portrayed by American actor John Cazale in the Francis Ford Coppola film adaptation and in the sequel, The Godfather Part II. The Godfather Saga is a TV miniseries that combines The Godfather and The Godfather Part II into one film. It originally aired on NBC over four consecutive nights in November 1977. The Godfather Saga is also known as The Godfather: The Complete Novel for Television, The Godfather: A Novel for Television, The Godfather Novella, and The Godfather Epic. 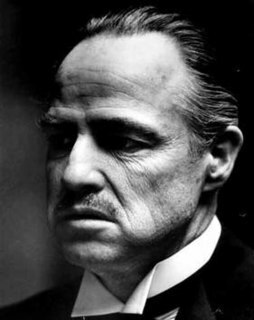 The television version was the basis for a shorter, 1981 video release known as The Godfather 1902–1959: The Complete Epic. 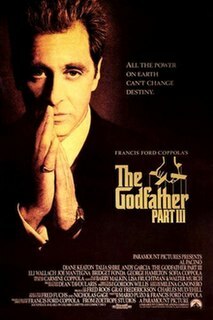 Following the release of The Godfather Part III in 1990, a third unified version was released to video in 1992 entitled The Godfather Trilogy: 1901–1980. 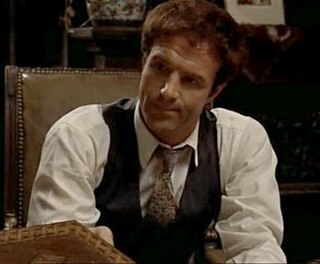 Thomas Hagen is a fictional character in Mario Puzo's novel The Godfather and Francis Ford Coppola's films The Godfather and The Godfather Part II. 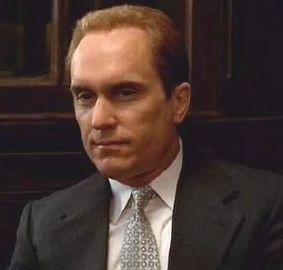 He is portrayed by Robert Duvall in the films. He also appears in the Mark Winegardner sequel novels, The Godfather Returns and The Godfather's Revenge, as well as Ed Falco's novel, The Family Corleone. Peter Clemenza is a fictional character appearing in Mario Puzo's novel The Godfather and two of the three films based on it. He is played by Academy Award-nominee Richard Castellano in Francis Ford Coppola's film adaptation of the novel, and by Bruno Kirby in The Godfather Part II. Hyman Roth is a fictional character and the main antagonist in The Godfather Part II. He is also a minor character in the novel The Godfather Returns. Roth is a Jewish mobster and investor and a business partner of Vito Corleone, and later his son Michael Corleone. He is based on New York mobster Meyer Lansky and was played by Lee Strasberg in the movie. Carmela Corleone (1897–1959) a fictional character in Mario Puzo's The Godfather, is the wife of Don Vito Corleone. Carmela is portrayed by Italian-American Morgana King in Francis Ford Coppola's film adaptation of the novel, and in The Godfather Part II. Frank "Frankie Five Angels" Pentangeli is a fictional character from the film The Godfather Part II. In the film, he is portrayed by Michael V. Gazzo, who was nominated for a Best Supporting Actor Oscar for his performance, which he lost to Robert De Niro, his co-star from the same film. He gets his nickname from his last name, which is Greco-Italian for "five angels". Anthony Vito "Tony" Corleone is a fictional character in The Godfather trilogy of films directed by Francis Ford Coppola. He is portrayed by Anthony Gounaris in the first film, James Gounaris in the second, and singer Franc D'Ambrosio in the third. He is the son of Michael and Kay Corleone, and the older brother of Mary Corleone. While Anthony was never a major character in the first two films, major events in his life were the backdrop of key parts of the second film, and his relationship with his father is a plot point in the third film. He was not mentioned by name in the novel. Sandrinella "Sandra" Corleone is a fictional character appearing in Mario Puzo's novel The Godfather, the Godfather film trilogy, and the Godfather video game. She was portrayed by Julie Gregg in the first film. The Godfather is an American film series that consists of three crime drama films directed by Francis Ford Coppola inspired by the novel of the same name by Italian American author Mario Puzo. The films follow the trials of the Italian American mafia Corleone family whose patriarch, Vito Corleone, rises to be a major figure in American organized crime. His youngest son, Michael Corleone, becomes his successor. The films were distributed by Paramount Pictures and released in 1972, 1974 and 1990. The series achieved success at the box office, with the films earning over $550 million worldwide. The Godfather is seen by many as one of the greatest films of all time, while The Godfather Part II is viewed by many as the best sequel in cinematic history. The series is heavily awarded, winning 9 out of 29 total Academy Award nominations. Constanzia "Connie" Corleone is a fictional character in The Godfather, a novel by Mario Puzo and the 1972 film The Godfather. In the film, Connie is portrayed by Talia Shire, the sister of the director Francis Ford Coppola. Shire was nominated for the Academy Award for Best Supporting Actress for her portrayal of Connie Corleone in The Godfather Part II. ↑ "The Godfather II". British Board of Film Classification . Retrieved December 20, 2014. 1 2 3 "The Godfather Part II (1974)". Box Office Mojo . Retrieved May 26, 2014. 1 2 "The Godfather: Part II (1974) - Financial Information". The Numbers . Retrieved December 20, 2014. ↑ Stax (July 28, 2003). "Featured Filmmaker: Francis Ford Coppola" . Retrieved 30 November 2010. ↑ "The National Film Registry List – Library of Congress". loc.gov. Retrieved 2012-03-12. ↑ Phillips, Gene (2004). "Godfather: The Intimate Francis Ford Coppola". ISBN 9780813123042. ↑ Cagney, James (1976). "Cagney by Cagney". Doubleday. ISBN 9780671808891. 1 2 Canby, Vincent (December 13, 1974). "'Godfather, Part II' Is Hard To Define: The Cast". The New York Times. Retrieved March 8, 2017. ↑ "Movie Set Hotel: The Godfather II", HotelChatter, 12–05–2006. ↑ Eagan, Daniel (2009). America's Film Legacy: The Authoritative Guide to the Landmark Movies in the National Film Registry. Bloomsbury Publishing USA. p. 712. ISBN 1441116478. ↑ Biskind, Peter (1991). The Godfather Companion. Wildside Press. ISBN 0809590360. ↑ "The Godfather, Part II". Turner Classic Movies, Inc. Retrieved March 8, 2017. 1 2 "The 'Godfather Part II' Sequel Syndrome". Newsweek. December 25, 2016. Retrieved March 8, 2017. But when the movie arrived in theaters at the end of 1974, it was met with a critical reception that, compared with today's exuberant embrace, felt more like a slap in the face. [...] Most professional tastemakers, even those exasperated by what they felt was the movie's sometimes plodding-pace, recognized the creative crowning achievements of the film's direction, cinematography and acting. ↑ Berliner, Todd (2010). Hollywood Incoherent: Narration in Seventies Cinema. University of Texas Press. pp. 75–76. ISBN 0292722796. ↑ Ebert, Roger. "The Godfather, Part II". RogerEbert.com . Retrieved November 25, 2018. ↑ Siskel, Gene (December 20, 1974). "'The Godfather, Part II': Father knew best". Chicago Tribune . Section 3, p. 1. ↑ Garner, Joe (2013). Now Showing: Unforgettable Moments from the Movies. Andrews McMeel Publishing. ISBN 1449450091. ↑ Ebert, Roger (October 2, 2008). "The Godfather, Part II Movie Review (1974)" . Retrieved March 8, 2017. ↑ Sragow, Michael (2002). 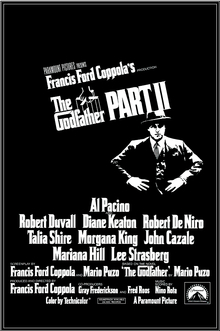 "The Godfather and The Godfather Part II" (PDF). "The A List: The National Society of Film Critics' 100 Essential Films," 2002. ↑ "The Godfather, Part II". rottentomatoes.com. 20 December 1974. Retrieved 13 March 2016. ↑ "TV Guide's 50 Greatest Movies On TV/Video". thependragon.co.uk. Retrieved 13 March 2016. ↑ "DVD review: 'The Godfather Collection'". DVD Spin Doctor. July 2007. 1 2 "47th Academy Awards Winners: Best Picture". Academy of Motion Picture Arts and Sciences. Archived from the original on April 2, 2015. Retrieved April 20, 2015. ↑ McNamara, Mary (2 December 2010). "Critic's Notebook: Can 'Harry Potter' ever capture Oscar magic?". Los Angeles Times . Retrieved 3 December 2013. ↑ "AFI's 100 Years...100 Movies" (PDF). American Film Institute . Retrieved November 14, 2014. ↑ "AFI's 100 Years...100 Heroes & Villains" (PDF). American Film Institute . Retrieved November 14, 2014. ↑ "AFI's 100 Years...100 Movie Quotes" (PDF). American Film Institute . Retrieved November 14, 2014. 1 2 "AFI's 100 Years...100 Movie Quotes Nominees" (PDF). American Film Institute . Retrieved November 14, 2014. ↑ "AFI's 100 Years...100 Movies (10th Anniversary Edition)" (PDF). American Film Institute . Retrieved November 14, 2014. ↑ "AFI's 10 Top 10: Top 10 Gangster". American Film Institute . Retrieved November 14, 2014. ↑ "EA Announces New Street Date for The Godfather II". EA.com. February 11, 2009. Retrieved 2009-02-12.